DePauw Police Department partners with Campus Eye to provide a mobile reporting solution. DePauw Police Department would like to invite you to join our new campus-wide reporting solution, Campus Eye. It provides a direct line of communication across our entire campus for reporting general safety and physical safety issues. With Campus Eye, you can use technology you are already familiar with to instantly send reports to the DePauw Police Department. You also have the option of reporting anonymously, if desired. All reports will help students, faculty and staff report information get quickly to the appropriate departments can take immediate action and handle campus security or physical security issues as they arise. 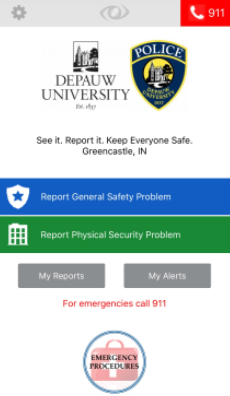 The app also features one touch dialing to 911 and immediate access to DePauw University's Emergency Procedures. You may also use your computer to send a report by using the Web Reporting Feature. 1 GO TO THE WEBSITE Locate the specific URL on your school’s website Or go to https://mycampuseye.com/web/YYAL. A Mobile App Account is NOT required to send Web Reports.